Amanda is a writer in upstate NY. Known as Aife ingen Chonchobair in Derthaige (formerly Aoife inghean Conchobair) in the SCA, she focuses on the Bardic Arts, telling stories, writing poetry, singing songs, playing harp, and occasionally being a part of the infamous traveling bardic gong show. Her device is "Azure, three bezants each charged with a triskelion of spirals azure." She is married to Joel Messerer who continues to put up with this insanity. She dabbles in the textile arts in her spare time as well. She primarily plays in the Barony of Concordia of the Snows. Aife has one current student, Lady Finnguala. Finnguala is focused on the bardic arts and early Ireland. From October 2009 to October 2010, she was Baronial Bard of Concordia of the Snows to His Excellency Angus Kerr. From February 2010 to February 2011, she served as King's Bard of the East. On May 27, 2012, she was Elevated to the Order of the Laurel. Aife is a late 7th Century Irish woman. Key events that would have affected her in her lifetime would include the Synod of Whitby (which attempted to bring the Celtic church in line with the Roman church), as well as the plague that swept through the British isles in the late 7th century. 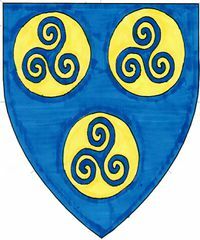 King's Bard to Konrad von Ulm II, Edward Grey of Lochleven, and Gryffith FitzWilliam II. I first ventured into exploring Early Medieval Irish Poetry in September 2009. I'm learning as I go. These are listed roughly in order, but, does not include any poetry included in stories I've told. as war drums thunder and battle rings. the Eastern Tyger is called to war. black the fields from battle scars. hear the Tyger's mighty roar. Bowman loose your arrows swift. Foes will shake at blackened sky. Sky will sing with fatal gift. Guard us with your deadly eye. Swear on chain of honor bright. Rise! the host of eastern knights. Blood of heroes runs through our veins. Blood, the price of honor and pride. blood that cannot be denied. Sing for her, beloved rose. Sing for Countess both fierce and gentle. Praise the splendor of her noble heart. Sing for her, courtesy's rose. Sing for joy of her constant smile. Praise the generous and lovely Caoilfhlionn. Crown'd in grace and wisdom. Sinn ag loighe ar in lucht romhainn, lucht oile orainn san uaigh. We rest on those who came before us, and others will rest on us in our grave. to swords, shields, and honor's fight. kin to all whom he'd command. the Crowns we bestow in trust. to hearts proven strong and just. Unless the earth breaks asunder.